very poor appetite and would not drink much water. Zoe was very sickly and inactive. Too sick to get vaccinated, said the vet. I was worried he wouldn’t make it. The first couple days, he would constantly look away when we approached. Additionally, he kept licking his lips. Both are calming signals – “a language which is there to make sure that dogs have a way to avoid and solve conflicts and live together in a peaceful manner.” He was trying to tell me that he was uncomfortable. I was stressing him out. So I left him in a cozy corner of my house, near his food and water. I carried on with my routine, giving him attention only when necessary. Calming signals are an efficient and easy way for human-and-dog communications. Just observe your dog – ask yourself why she’s doing what she’s doing. It can not only improve on a great situation, but also diffuse a tense one. 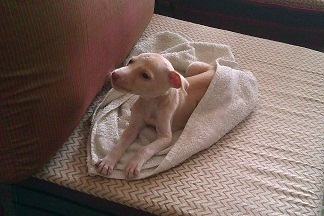 Within a week, Zoe improved his appetite, and his strength. We found out, he had a penchant for mischief like any other puppy. He would climb all over us and jump from one cushion to another. He was confident around us. And if you can look at him now!! He’s found his family. He’s naughty and playful! Alice, his pet-parent and the person who also initially found him, takes good care of him. And Bailey’s a good elder sister. Alice didn’t give up on Zoe despite living alone, having odd working hours, and his incessant peeing all over the house. You’re one lucky dog, Zoe!